Sandrine Rangeon used to play hockey -- both ice and inline -- for France, but gave those up after falling in love with roller derby. Alli Catraz joined the Ohio Roller Girls in 2005 and has been celebrating roller derby's renaissance ever since. The 37-year-old, who helps with membership for the Women's Flat Track Derby Association, has seen teams pop up all over the country in the past decade and even flourish in Canada, Europe and Egypt. This weekend, she and her Ohio Roller Girls teammates will get their first crack at competing in the international WFTDA championships, which start Friday in Milwaukee. "This is the end of a five-year plan we had with the goal to make it to championships," she said. "And here we are." From Bonnie Thunders to Amy Spears to Sandrine Rangeon and more, check out some of roller derby's biggest stars in action here. One roster note: It will be Amy Spears skating for the Ohio Roller Girls, not Alli Catraz. "Since derby was no longer just something I was doing on the side -- it became a major part of my life -- I wanted to use my real name," said Spears, who has been skating as Amy Spears for the past couple of years and has been applauded by fans who incorrectly think her name is a reference to a Britney Spears lyric. "People ... actually compliment me on the clever song reference. But it [is not] a derby name at all." Derby stars representing teams from New York, Los Angeles, London and other cities will face off in a knockout-style competition this weekend in pursuit of the coveted Hydra Trophy. The tournament is run by the WFTDA, which was founded by 30 roller derby leagues in 2005 as a means to standardize the sport and promote competition. WFTDA has grown to include teams in Canada and Europe, with nearly 300 affiliated leagues overall. "Emails from newly formed leagues used to be about what to call events and catchy derby names," Spears said. "Now it's questions coming from Ireland to India, asking about safety, international travel and how to run a league like a business." A quick lesson: Roller derby is played full contact by two teams of five who skate counterclockwise around a track. Bouts are an hour long, and each team's "jammer," the designated scorer who wears a star on her helmet, scores points by lapping members of the opposing team. Played in two 30-minute halves, each bout is broken down into two-minute-long "jams" in which opposing teams can field a fresh lineup of four more blockers and a new jammer. The inaugural roller derby World Cup was played in 2011. Sandrine Rangeon, then known as Francey Pants, was one of 200 athletes (with names like Fisti Cuffs, LuluDemon and Bone E. Vicious) from 13 countries competing at the Toronto event. Rangeon, who started playing roller derby three years ago, represents a growing number of athletes who have taken up roller derby following a successful career in another sport. She makes the case for getting recognition under her real name for her roller derby accomplishments. "Come spend a week with me and I'll show you if I'm a real athlete or not," she said. Move over Allie Catraz; Amy Spears is coming through. Rangeon, who now plays for Chicago's Windy City Rollers, spent nearly a decade as an ice hockey player after making the French national team at age 16. She also spent eight years on Team France's inline hockey team. During that time, Rangeon participated in 12 world championships and earned multiple medals. But it wasn't until she moved to California for grad school that she discovered competitive roller derby. "I started playing roller derby just to stay in shape for hockey, as a hobby that I didn't really care about," Rangeon said. "Then I fell in love with the sport and decided to quit hockey so I could focus on roller derby." 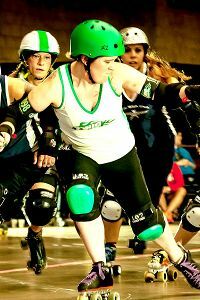 Since switching from ice skates to quads, Rangeon's nimble feet have helped her become one of derby's most feared offensive players. 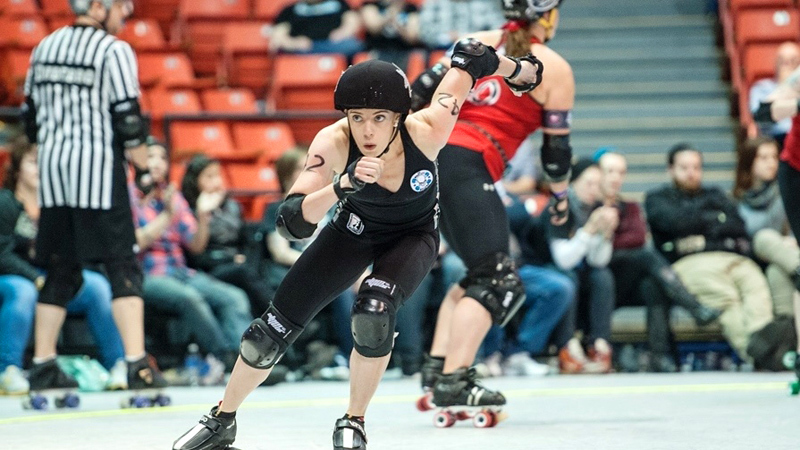 In 2012, as a member of the Denver Roller Dolls, she helped Denver take third place in the WFTDA championships while also being named most valuable jammer. After a recent move to the Midwest, Rangeon, 27, joined Windy City and added more point-scoring firepower to a club already known for its physical prowess. "Skating sports are inherently very technical activities," Rangeon said. "Hockey is about agility and explosive movements, which is what I try to use a lot when I'm jamming." The Windy City Rollers' reputation as an experienced, versatile team makes the addition of Rangeon's speed an attention-grabbing development just before the championships. But nobody's ready to hand over the trophy. 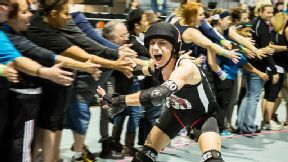 "In 2013, it's anyone's game," said Nicole Williams, one of roller derby's most celebrated players who skates for the New York City powerhouse Gotham Girls Roller Derby as Bonnie Thunders. "Compared to five years ago, the level of training people are willing to put into roller derby has significantly increased the level of skill and game play on the table," she said. Williams, 30, helped the USA beat Canada 336-33 in the World Cup final in Toronto two years ago. She says she improved her own game by weight training between seasons. Typically, derby's best players train vigorously off skates through CrossFit, yoga and other core and strength training. "Even players from smaller teams are improving the game," said Williams, who has won back-to-back WFTDA titles with Gotham. "Teams like Ohio have a number of players who have played together for years, and I think that adds to their success." Sarah Hipel, who plays for the Texas Rollergirls in Austin, was the first player to skate an official bout under her real name. The popularity and level of competition in Texas means just making a roster is an accomplishment. The next World Cup will be held in Dallas in 2014. "Texas is a special place to play derby, and you definitely have to work for your place all the time," said Hipel, formerly known as KillBox. "But we have a solid team and expect to fare well in Champs this year." After playing for nearly a decade, she knows well the impact the sport has on an athlete's life. "I figured out early on that derby has a lot of immediate rewards," said Hipel, who played five years in Detroit before moving to Texas. "I started to travel the country for games, then picking up coaching gigs in places like England. So any concept of time commitment or injury is not even equitable to what the game contributes to your life and the lives of those around you."